Peas on earth: actress Calista Flockhart goes all flower power while boyfriend Harrison Ford enhances his green credentials. 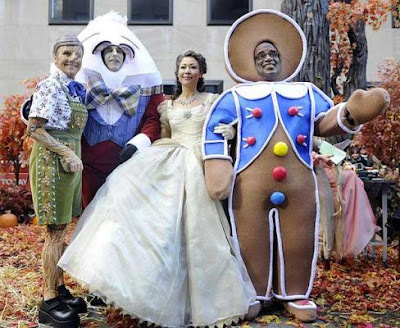 Staff on the NBC 'Today' television programme, dress as fairy-tale characters for their annual Halloween show in New York's Rockefeller Centre. 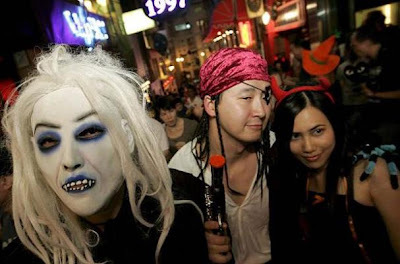 Revellers celebrate Halloween in the Lan Kwai Fong night life district of Hong Kong, China. 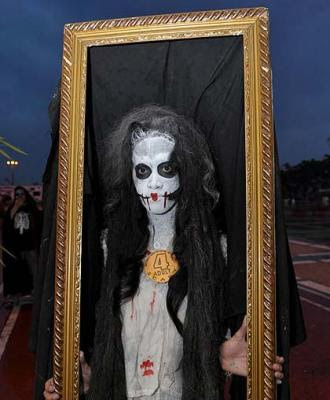 A resident of Manila's Marikina suburb parades in Halloween costume during a parade. 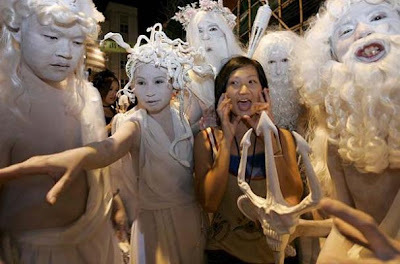 Scarily good fun: revellers enjoy their Halloween celebrations in Hong Kong. 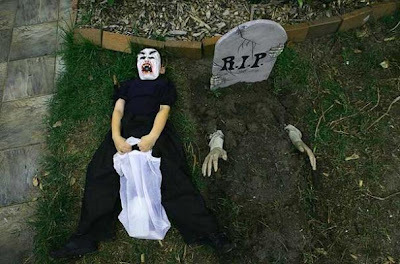 Dead funny: A young boy lays beside a mock grave in the garden of his home in Australia. 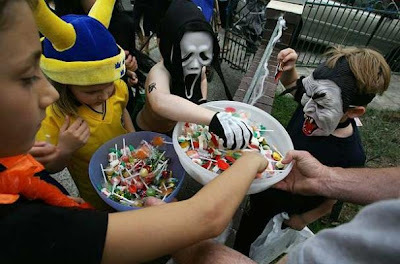 Children collect treats from local residents on Halloween Day in North Bondi, Sydney, Australia. 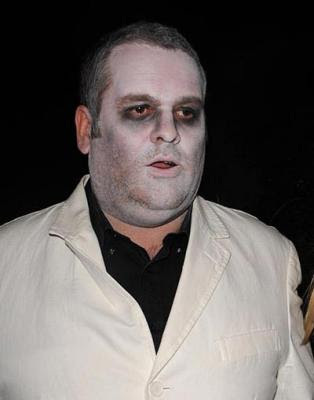 Breakfast DJ Chris Moyles in Halloween garb as he heads to a private party thrown by the controversial BBC presenter, Jonathan Ross. 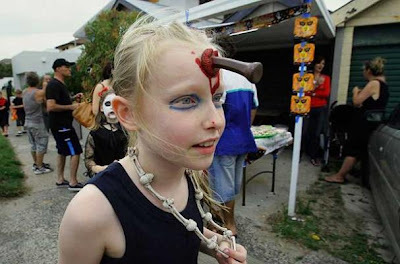 A young girl dress in costume while trick or treating homes on Halloween Day in North Bondi, Sydney. A child gets painted by a relative as they prepare for a Halloween costume contest in Manila. 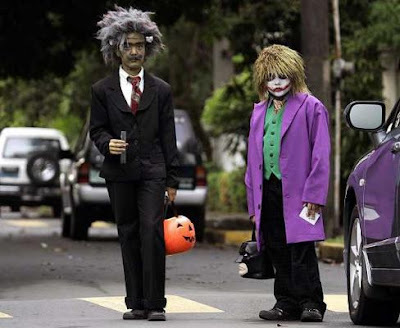 Youths wearing Halloween costumes make the rounds of Manila's Makati city to receive candies and sweets. 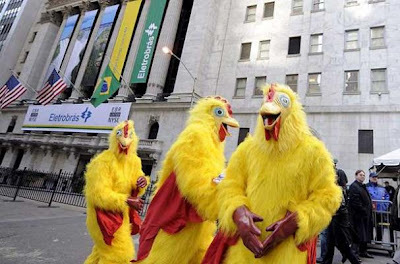 Men dressed in chicken suits for Halloween dance on the pavement near the New York Stock Exchange. 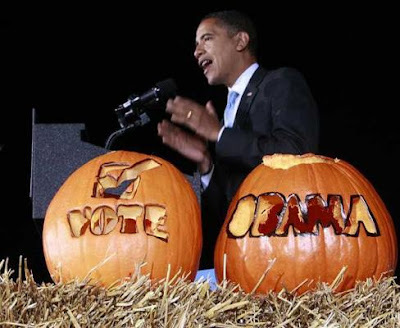 US Democratic presidential nominee Senator Barack Obama campaigns in front of carved Halloween pumpkins during an election rally in Columbia. 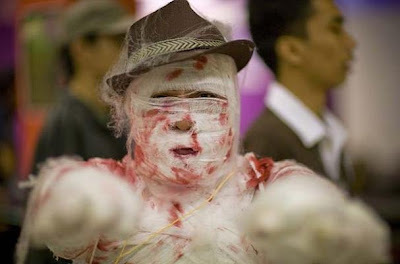 A contestant participating as a Mummy poses before the start of a Hallowe'en costume contest inside an amusement park in Manila. Hosts get into the swing of things for NBC's Annual Halloween Show.